Making a purchase could not be easier. Just browse our catalogue, and click on any items that you wish to buy and put them into the shopping cart. After you have finished your selection, proceed to the checkout and you will be asked for a few details that we need to be able to satisfy the order. 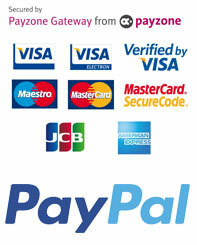 Payment options "Payzone" and "Paypal" will appear when your billing details have been entered. Payment details are not collected or stored on our website.Details for Visa and Mastercard are processed by "Payzone", a leading secure payment provider, or by "Paypal". Please proceed to our “Payzone” payment screen and enter credit/debit card details in complete confidence.No card details are received or retained by the Windhorse Imports site.and they are not held in clear text on any web site. When your transaction has gone through successfully you will see a detailed receipt page with your order reference and purchase total. You can print out your detailed receipt. You will also be sent an email confirming the details. Alternatively you can pay via PAYPAL by selecting this option from the drop down menu in the payment screen. We also take credit card orders by phone. We accept most major credit cards, Paypal, cheque, or postal order, in payment and will accept Euros and US$ calculated at the current exchange rate.